Founded in 1629, Charlestown is Boston’s oldest neighborhood. Small and friendly, this neighborhood is located on a landmass separated from the rest of Boston by the Charles River and Boston Harbor. The community is known for its impeccably maintained historic homes and industrial buildings, along with many well-known dining experiences. Like many of Boston’s neighborhoods, Charlestown has seen considerable gentrification, which started in the 1980’s. Charlestown offers the historic charm of gas lamps and brick sidewalks as seen in Beacon Hill, but for a more reasonable price and is popular among young professionals. Residents spend a day at one of the many historic sites situated in this neighborhood, including the Bunker Hill Monument and the Navy Yard, the oldest shipbuilding facilities in the United States Navy that houses the USS Constitution. Families and tourists wander the docks and tour Old Ironsides of this National Historical Park. Afterwards, residents settle in to one of the many welcoming pubs and restaurants dotting the Charlestown neighborhood. Restaurants that have been there since the 1700’s like the Irish pub of Warren Tavern are intermingled with new favorites like that of Brewer’s Fork and Pier 6 Boston Waterfront. Downtown Boston is easily accessible from Charlestown via bus, subway, and ferry. Charlestown offers two MBTA stops on the Orange Line, the Community College and Sullivan Square stops, as well as two bus lines. 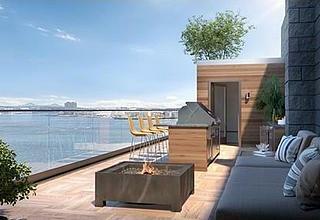 If you’re looking for a waterfront apartment in Boston, consider Charlestown. There are multiple complexes, some within the Navy Yard, to choose from. Contact an Advisors Living agent to learn more about this historic place and the inventory that this neighborhood has to offer.